Now, this is so open for interpretation. The someone special in life are several people. All the people that I love and miss. My sisters, my cousin, some friends that I don't see anymore. So I created a card that summarizes how I feel. I again attempted a vintage card, not sure I'm happy with the tea dye distress ink, I think I really prefer old paper. I also was inspired by one of my sister's friend and fan, Jessi to create my own crocheted border. She made the sweetest mats for my sister and I studied it and then came up with my own. You like? I also used some highly hoarded chocolate brown velvet ribbon. 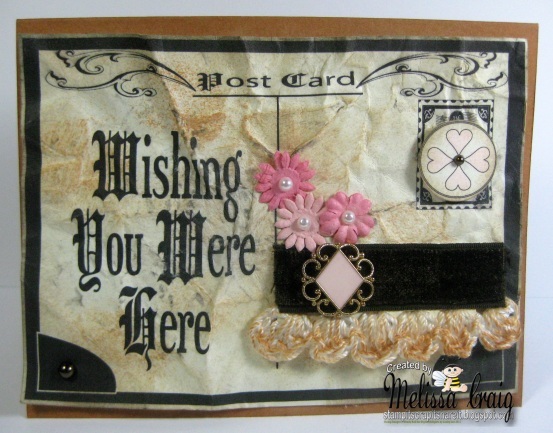 Fab card, great way to use the postcards! Miss - this card is just fabulous. I love the chocolate ribbon (I'd hoard it too). I wish I were there too!! I just love the old postcard look! You did a fab job with the distressing and that crocheted border is awesome.